235 p., 14,7 x 20,8 cm. Edited by Angelika Ebrecht-Laermann, Bernd Nissen, Claudia Thußbas and Uta Zeitzschel. With contributions by Anna Bentinck van Schoonheten, Pietro Bria, Uta Karacaoğlan, Eckart Leiser, Riccardo Lombardi, Ulrich Moser, Paolo Cesar Sandler and Peter Wegner. The investigation of microprocesses plays an increasingly important role in psychoanalysis. With the discovery of transference, countertransference, projective identification and enactment, but also with the new understanding of the binocular interaction of conscious and unconscious processes, the complex structures and multi - layered dynamics that occur in the analytic encounter are brought to the fore. For this purpose, the interpsychic events were investigated microscopically; theories and concepts that help to understand these dynamics were extended. The present volume »Microprocesses« presents in its contributions both such subtle interpsychic dynamics as well as central concepts and theories (for example Matte-Blanco’s theory of bi-logic, Bion’s concept of hallucinosis, and Aulagnier’s reflections on the pictogram) that deepen the understanding of psychoanalytic processes. In the first part of this paper we describe transformations that occur in a single dream. In the second part, we give an example and discuss the conditions under which transformations in a series of dreams can be identified and interpreted. Transformation implies that the transformed elements are maintained. Therefore, they need to be identified in a consistent and clear way by using a coding-system. What is transformed are not dream images or the narrated dream, but so-called features, which are elementary cognitive units of dream images. The microsequences are identified by the Zürich Dream Process Coding System (ZDPCS). The author introduces the concept of the unconscious as developed by Matte- Blanco. Matte-Blanco departs from Freud’s hint of a differentiation between a repressed and a structural unconscious and posits an isomorphism between the logic of the unconscious, the logic of emotions, and the logic of infinity. Matte-Blanco shows that an isomorphism exists between the logic of the unconscious, the logic of emotions, and the logic of infinity. In contrast to the asymmetry of classical logic which rules in the physical world, the unconscious works in a symmetric mode which is characterized by an identity of part and whole. If the symmetric logic comes into play within the classical logic, a bi-logical structure emerges which is based on both logics. The symmetric logic is also one of emotions. The unconscious simultaneously engages more than three dimensions, that is, it has other means of presentation. In analogy to the relation between conscious and unconscious processes, the dialectic between finite and infinite becomes the object of psychoanalytic research. In the French and Spanish-speaking world Piera Aulagnier is considered an important representative of an innovative aperture of psychoanalysis, both with regard to the clinical work and theory. Her clinical focus was the treatment of psychotics. These patients confront the analysts with a break between their claims of knowledge and the incapability of acting upon this knowledge in practice. 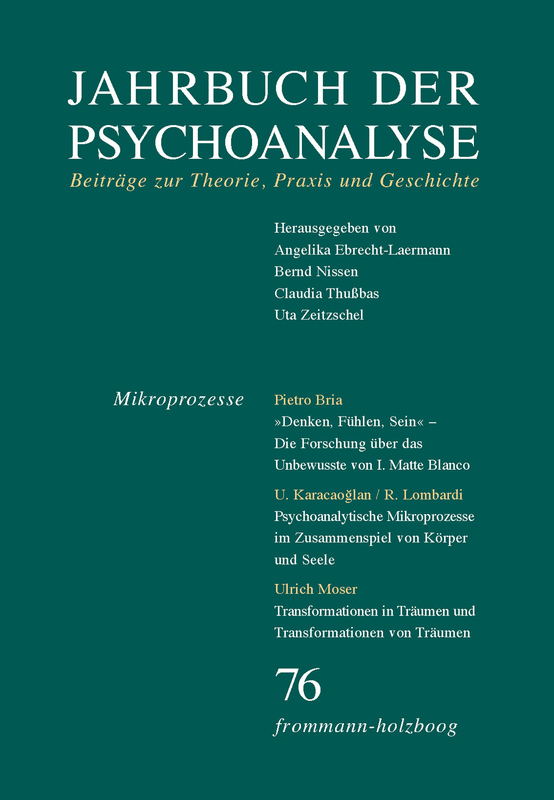 According to Aulagnier the failure of the analysis in the face of psychosis points to a phase prior to the formation of the Ego to which the psychotic returns. The postulation of such a phase means no less than the amplification of Freud’s metapsychology. Aulagnier claims the existence of a socalled original process upstream of the primary process, its key characteristic being the so-called pictogram in which the representing sensory organ and the represented object become fused. Here, the psychic apparatus emerges from the body in an act of autoevolution or ›autopoiesis‹. Aulagnier examines this act meticulously at the level of the microprocesses involved. Applied to the clinical work, her approach to comprehend the psychic processes with regard to their somatic origins provides important cues for the understanding of psychosomatic phenomena. Clinical material of the treatment of two delusional or psychosomatically ill patients is presented in order to investigate the implication of processes at the bodymind- bridge – and especially of the dissociation of the body – in the development and dissolution of such phenomena. In the context of events in the transferencecountertransference- relationship the focus is directed to the analysand’s transference onto his own body and the use of the analyst’s somatic countertransference. In fostering the implementation of a relationship between the analysand and his body in the sense of a »concrete original object«, subsequently the analysand’s relation to reality and his ability to think improve. In a profound sense the presented working through in analysis is relational. By the use of his own – also bodily – perceptions, the analyst has the task to realize the state the analysand is in. Regarding the technical approach it is discussed how emphasis is put on the support of the self-perception and the vertical axis in the relationship of the analysand whereas the interpersonal transference is used only implicitly. The work presents the reality, the ›here and now‹ of the analytical sessions, on a ›microscopic observation stage‹. Only on this level can the spectrum of facts formed by perceptible stimuli of at least six interconnected ›transformations‹ be captured. The ›dream work‹ has been described as the first transformation in psychoanalysis. Beyond that, the author distinguishes (i) the transformation into rigid motion; (ii) projective transformation; (iii) transformation into hallucinosis; (iv) transformation into psychoanalysis – subdivided into (iv-a) transformations into ›K‹ (knowledge) and (iv-b) transformation into ›O‹. The final ›psychic products‹ of the ›transformations‹ are mediated on a material and an immaterial ›path‹. The author examines the detailed clinical data of a six-year psychoanalysis with theories of transformation in hallucinosis and those of the ›minus‹-region. After a brief integration into current research in psychotherapy and the group seminar developed by Wolfgang Loch for the understanding and interpretation of psychotherapeutic and psychoanalytic treatment processes, the author undertakes to outline some so-called micro-processes that could be generated according to Wolfgang Loch’s method in seminars and to test their applicability in the context of a classically dual treatment situation: ›synchronisation‹, ›self-efficacy‹ and ›recombining pathological self-organisation‹. The clinical illustration originates from a fairly new, medium-frequency psychoanalytic treatment and seeks to explain the indication, the course of the treatment up to the 103rd session and the specific psychopathology of an approximately fiftyyear- old patient and to set these conclusively in a meaningful context using micro-processual conceptualisations. Three modes of psychoanalytic working are differentiated. The continuation of the investigation and the associated comparison of the interpretation of the 103rd session by Mr S and his analyst (part 1), the secondary consideration of this material by a group and the detailed evaluation of this new material are traced and set in a research context. This article discusses the place of Karl Abraham in the history of psychoanalysis. It describes how he encountered Freud and how his theory ostensibly developed in the wake of that of Freud. Ostensibly because, upon closer reflection, after 1907 Abraham seems to have followed a path of his own and developed his own theory. A theory that he himself considered to fit in completely with Freud’s. The second half of the article describes the meeting between Abraham and Melanie Klein. First, it describes what that encounter signified to Melanie Klein in practical terms and, secondly, it deals with the theoretical influence. All of this builds upon the first half of the article about Abraham’s own theoretical development.